Facts and history about the life and lifestyles of Native American Indians. There were many hundreds of Native American Dances that were performed by all the different tribes across the continent of North America. Dancing was always accompanied by music including the beat of drums, rattles, whistles and the chanting of singers. Dances were performed for a variety of reasons to mediate with spirits forming part of great religious ceremonies and rituals They included war dances, victory dances, fertility dances, homecoming dances, rain dances and dances that reflected creation stories and mythical legends. 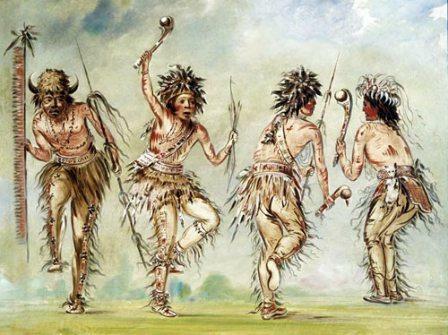 The names of the most famous dances performed by Native Americans included the War Dance, Buffalo dance, Deer dance, Pipe dance, Green Corn Ceremony, Hoop Dance, Scalp Dance, Rainmaking or Sun Dance, Turkey dance, Snake Dance, Ghost dance and the Dog dance. These dances and the ceremonies, rituals and music that accompanied them held a very important place in the culture and religion of Native American Indians. Specific dances are described in this article together with a facts sheet providing additional, interesting information about the steps, regalia and history about famous Native American dances. Native American dancers prepared for dances with great care. The hair was carefully combed and arranged and face and body paint was frequently applied. Special, symbolic dance costumes were frequently worn. In the magical buffalo dances the skins of buffalo, with the head, skin, and horns attached, were worn to mimic the animal. Masks were worn Kachina dancers who acted as mediators with the Kachina spirits. The dress, regalia and decorations all had sacred and specific meanings. The Ghost Dance was part of a mystical ceremony and ritual that was initiated by two Paiute prophets called Wodziwob and Wovoka to re-establish the Native Indian culture and to bring an end to the westward expansion of whites and a return of the land to the Native American Indians. The ceremonies lasted for five successive days and Ghost dancers underwent rituals that resulted in hypnotic trances. The Ghost Dancers wore special shirts which the Native Americans believed could not be pierced by the bullets of enemy soldiers and each dancer wore a symbolic Crow feather in his hair. . The movement spread to many other tribes and was a central feature among the Sioux tribe just prior to the massacre of Wounded Knee and the end of the Sioux Wars (1854 - 1891). For additional facts and information refer to the legend and story of Crazy Horse, and Sitting Bull. Women also played important roles in ceremonies such as the Scalp Dance which were performed by women, such as those of the Spokane tribe, as a public act of revenge. A woman who wanted revenge would whirl around a fire flailing the scalp of the enemy and kicking in revenge. She was attended by other women who danced and chanted, as did the rest of the tribe, to the beat of drums. The life, history and lifestyle of Native American Indians is a varied and fascinating subject. The following fact sheet contains interesting facts and information on Native American Dance. Native American Ceremonies and rituals included the War Dance, Kachina dances, the Buffalo dance, the Green Corn Dance, the Scalp Dance, Rain Dances, the Sun Dance, the Snake Dance, the Dog Dance and the Ghost dance. Native American Dance Fact 3: Great Plains tribes, such as the Arapaho, Cheyenne and Crees, also performed important ceremonies at the summer solstice including the infamous Sun Dance ritual. During the ceremony the participants pursued their Vision Quest in which self-torture was undertaken as a penance or to induce a vision or trance state. During the ceremony group dances were performed in honor of the sun at the summer solstice. Native American Dance Fact 5: Great Basin Tribes including the Washoe tribe performed important ceremonies and dances including the Round Dance and the Pine Nut dance which were associated with the harvest of pinyon (pine nuts) in supplication for increased food supply and to bring rain. Native American Dance Fact 9: Dances were performed in different patterns such as circling dances, round dances and Serpentine line dances.